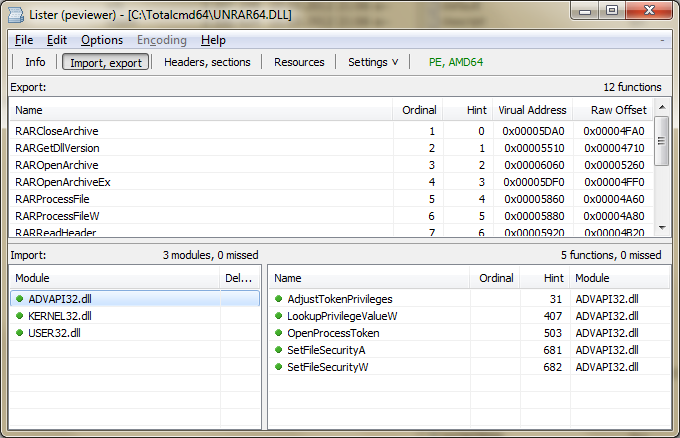 PE Viewer is intended to view the information on PE executable format modules (EXE, DLL, OCX, etc.). Plug-in shows functions imported and exported by the module, the detailed information about sections and headers of the module, and also the contained resources. ----- 2.0 ----- [*] Fixed error when viewing 64-bit module under 32-bit Windows. Checked working under Win2000 SP4. ------------ 2.0 Beta 5 ------------ [*] Fixed compiler determination bug. [*] Improved working with correpted or compressed resources. [*] Small GUI fixes. [*] Added default file extension addition when saving resources. ------------ 2.0 Beta 4 ------------ [*] Fixed AV on plugin opening. [*] Fixed sort direction on lists headers. [*] Fixed lists sorting. ------------ 2.0 Beta 3 ------------ [+] Added plugin configuration reading from custom PEViewer_config.ini. [+] Added support of the PEiD signatures. [+] "Copy" popup menu item in lists splitted into "Copy Line" and "Copy Value". [+] Added entry point icon into sections list. [+] Added option to disable remembering last opened tab. [+] Added option to choose plugin settings storage: lsplugin.ini (common for all plugins) or own plugin ini. [*] Improved validity check displaying. [*] improved delayed modules displaying. [*] Added support of icon resources with PNG data. [*] Fixed pseudo-button under text label with image info on tab buttons line. [*] Fixed columns resize in lists. [*] Widened extension list of the plugin used by default. [*] Fixed some bugs in import and export reading, in compiler determination. [*] Deleted column with ordinal function number in import list. Ordinal now displayed in the Name column. [*] Automatic compiler determination now disabled by default, added option to turn it on.